For pretty tape dispensers, click here. 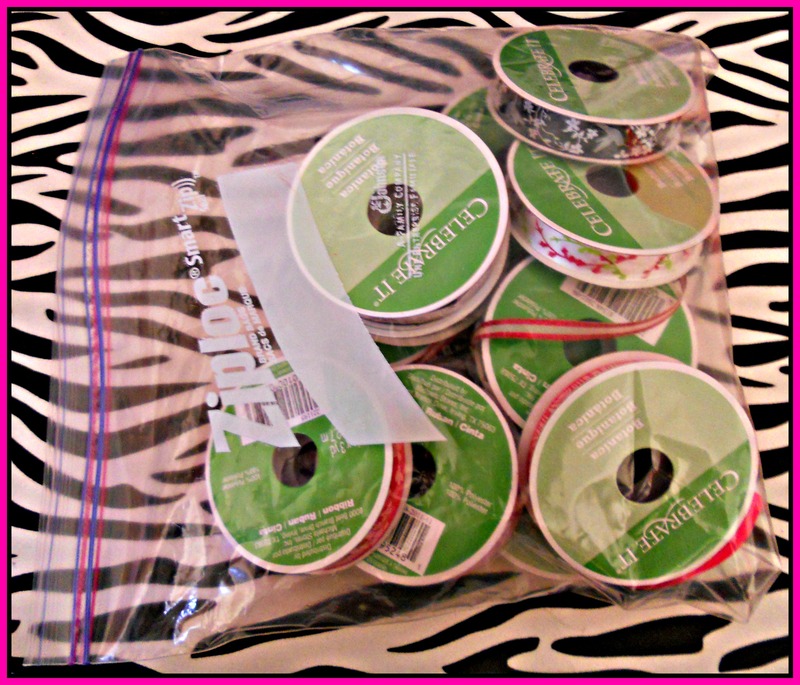 For a pattern weight jar, storage bin labels, and needle book, click here. For no-tangle bobbins, click here. For easy-access thread storage, click here. For neat and pretty embroidery floss storage, click here. For a pretty ironing board, click here. For a way to store and display your fabric flowers, click here and here. UPDATE: Emily at Two Purple Couches just sent me a tip that this and lots of other great storage tips are included in the September HGTV magazine! I did a little sleuthing and found a link here. Enjoy! This is a fabulous idea! I have ribbons absolutely all of the place in my hall closet and the mess stresses me out. I need to do this!!! All OVER the place, I mean. What a great idea!!! I love clever new uses for old things! I hear so much about Michael’s on various blogs. What lovely ribbon and what a brilliant way to display it. You are a craft genius! I’m lucky to have a Michaels just two miles away! 🙂 They don’t sell fabric, but they do have everything else crafty. What types of craft stores do you have where you live? Unfortunately nothing here is that easy to reach. We have a big hobbycraft a few miles away, but at the moment I need to persuade Mr M to drive me there. Internet shopping is my friend! awesome! I clicked on each and everyone of your craft room tips! I am fortunate enough myself to have my own craft room and love the organizing methods you use! My ribbons are on a wrought iron paper towel dispenser that I have mounted to the wall. I also use another wall mounted one to hang my tissue paper for gift wrapping. ok, but only if you promise to tweak the idea with your professional sewing skills….and then reblog. Clever, clever, clever; clever, clever!!! I am so going to do this! ooh I really like this idea! of course, I like all your ideas 😉 I could definitely use this in my craft room! Great idea for those every growing piles of ribbon! Love the ribbon idea, but I think I will need LOTS of them. Then figure out a place to put them. And if you don’t have enough ribbon, I found a great website: http://www.giftsintl-us.com/grosgrainribbon.php. This opens up to grosgrain, (50 yards for $1.10 … no kidding … ) I will be posting this and some other great internet finds on my own site http://www.lizjfoxdesign.com. … and I don’t work for any of them. That’s such a good idea! Simple but effective. What a great idea! Now if only I had twenty of these holders, there’d be my problem solved. Maybe a curtain rod…. Better than a curtain rod is a wooden dowel for $1.59 at the hardware store and two bathroom hooks to hold it up. Well, darn, why I have been stuffing rolls of ribbon into a box in the cupboard? I just followed your blog to get more good ideas! Love this! I need to do a separate one for Christmas ribbon. That would be soooo much easier than my jumbled box of tangled mess! Thank you! This is an awesome idea! I love it. I have boxes in the garage filled with ribbon that would be so much easier to use if on a roll. Such great ideas! I love how organised your crafting space is. Mine is all over the place, with stuff all over the place, too. Sometimes I just don’t do things because I first have to search for everything I’m going to need. You inspired me to get organised, it will definitely make all these little projects much more pleasurable! And thanks for liking my blog, I consider it a compliment.